One of the simplest bars to make is Krispies treats whether plain or flavored. I just recently made cocoa krispies ones that lasted only a few days in my house. The chocolate flavor was divine! 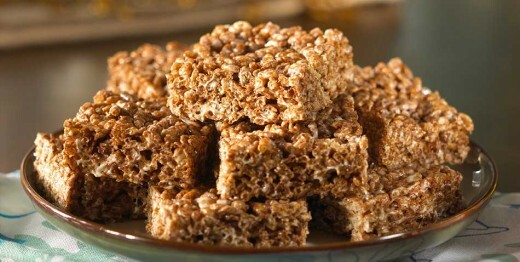 You can make then in so many varieties with using plain, chocolate or colored rice krispies cereals. You can top them with sprinkles or frostings; even leave them plain. They’re perfect either way. Stove top – Which I’ve always done. It take a little elbow turning those marshmallows but fun to watch them melt away in a cream in the pan. Microwave – I’ve never tried this one but I hear it turns out good. Store Bought In A Jar – There is no stove top or microwave mess with this one. Just get the Jet Puffed Marshmallow Cream. Everyone loves them from kids to adults! They are the most timeless simple treat I can think of! Add marshmallows and stir until completely melted. Stir often! Remove from heat and add coca krispies cereal. Stir until completely well coated. Spray a 9 x 13 pan with cooking spray then use a buttered spatula to fold in krispie mixture. Cool. Cut into squares; big or small.